Kang-cacs's interactive graph and data of "Figure 2. 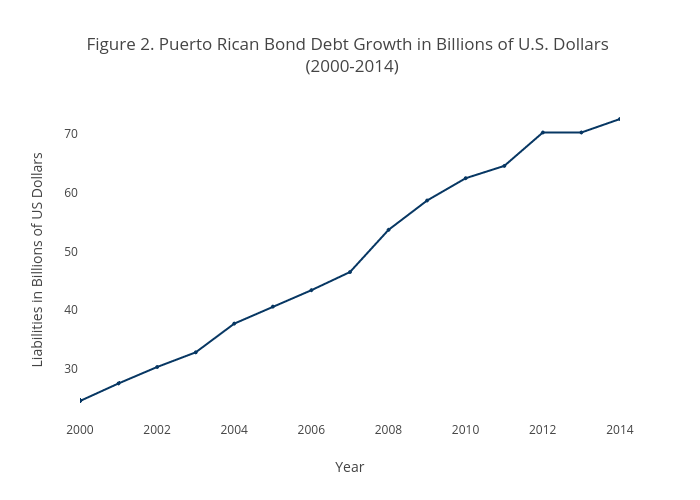 Puerto Rican Bond Debt Growth in Billions of U.S. Dollars (2000-2014)" is a scatter chart, showing Liabilities; with Year in the x-axis and Liabilities in Billions of US Dollars in the y-axis.. The x-axis shows values from 2000 to 2014. The y-axis shows values from 20.951867816091955 to 75.54813218390804.